It started off a bit too tight (merm, not comfortable in certain areas fo sho!!) and it just wasn't something that I was going to want to wear in the current state. ...and got this jumpsuit ready to be DIY'd. After taking in color thoughts from you guys, I created a dye bath for a handful of cotton/polyester pieces with a mix of RIT Peacock Blue and Emerald. My piece isn't shown below in the dryer, but it's amazing to see how the different pieces took to the color. I began the deconstruction next and started off by cutting off the legs of the jumpsuit! This didn't last in shorts mode very long. I opened up the crotch area and removed all the seams keeping the legs together. 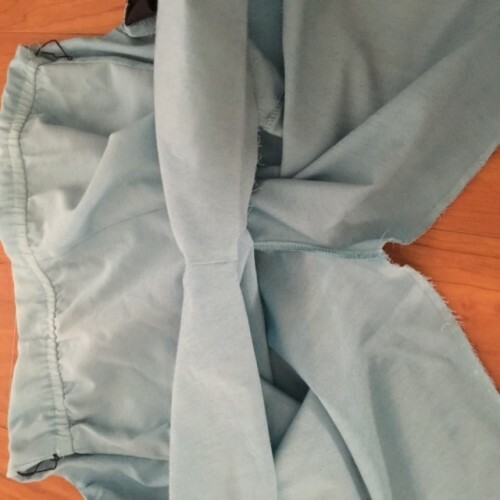 With the entire bottom of the piece open, it was time to create my skirt! I took the left and right side of the piece and created a center seam down the front and back, bringing all the fabric together to create a flat front and back. I stitched my new seams and created a brand new hem along the bottom of the piece. We started off looking much different than this, didn't we? The color was more of a turquoise shade which I loved. It's super summery and really a fab contrast with the black trim. Any of the slight discolorations from earlier are now gone and hidden by this gorg new shade. I took my outfit to wine country with me because making multiple stops at vineyards calls for a comfort. When you've got pockets, you've got comfort...if you ask me! Oh and this shot assisted in the little hole below my arm in the above shot. I put my arm up and, tearrrrrrrrrrrr. Luckily I always try to carry a little emergency kit with me so safety pins saved the day! There were tons of flags at each vineyard to celebrate the 4th, so I went to town with all of them. Every. Single. One. This piece still makes me shake my head because I didn't think it would turn out as bold as it did! Thanks to everyone who offered thoughts on what color to dye this here and on Instagram! More dyeing to come this week. Stay tuned! I've been playing around with a bunch of fun pieces that you'll see over the next few days!! This one looks like something that I would have worn when I was six as my nightgown. This is like the grown-up, adult version! PS, it's velour!!! This one feels like I should be in Annie. You know, if Annie gets remade again and it's all adults playing the orphaned kids? I was beyond in love with this piece and honestly, if it wasn't so tight in the crotch-al area (you gals know what I mean) I would have made this work. Unfortunately circulation was being cut off and it just wasn't meant to be. ...but the bottom portion had to get loosened up a bit. And by a bit, I mean completely! To begin, I trimmed the pant legs to right above the knees. Post trim, I needed to open up that crotch-al area!! 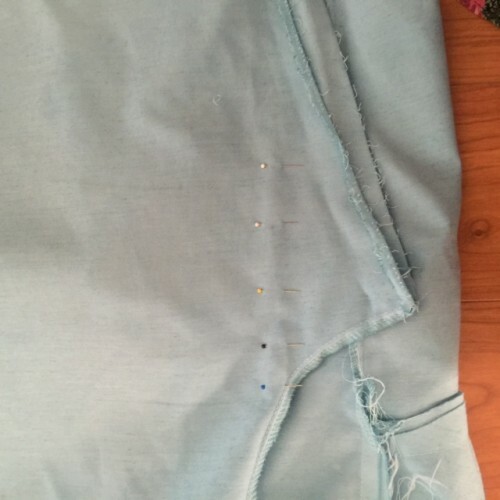 I'm turning this into a skirt, so I began to remove all the stitches on the inseam. ...and then stitched a new hem. My brand new piece is looking good!!! I must say that by making that one major tweak, I'm highly in love with how the former jumpsuit looks now! I'm poppin' collars like a boss!! I paired my new dress with some black BCBG heels and a vintage beaded purse to break up the red/white palette. And even though the top portion still feels a bit retro, the pockets and cleaned up feel of the bottom give it a totally current look. It's still warm here in Southern California, so my "winter" wardrobe has been a bit modified this season! This is a piece that I can't get enough of, so I'll be wearing it again soon. Perhaps when it actually hits 50 degrees I can add some stockings and a sweater?!? Also, the zippered area in front makes this piece SO easy to get in and out of! Zipper > buttons, any day! !